It seems when I like a product, I tend to buy it in fours. The list of such “must haves” is extensive but for today I’ll focus on the By Terry Ombre Blackstar “Color Fix” Cream Eyeshadow sticks. Ever since I got these, I’ve been raving about them and it’s now the gold standard I compare rest of my eyeshadows to. By Terry has always been one of those brands I was aware of but never had the inclination to buy for lack of accessibility and the not so appealing price. Trust beauty bloggers to turn that around! I’m now a certified By Terry fan and I’ve been fixated with these cream eyeshadow sticks since last year. I came very close to buying a blush and their foundation but I’ve put it off for now. Can we just focus on the oh so sleek packaging for a hot minute? It’s sturdy, heavy, great to travel with and just pretty! I appreciate that the packaging is so uniform and yet you can tell the colours apart. Prior to this the only cream eyeshadow of note I had used was the Clinique Chubby Stick for Eyes and an Urban Decay one. Each have their flaws and the Ombre Blackstars just manage to get everything right. The pigmentation is very opaque considering the texture. It feels incredibly light and smooth when you apply it to the lid, there’s no tugging. The heaviest swipe feels like a very light layer. A year on, the stick I’ve had for the longest hasn’t dried out either. I don’t have very oily lids but it stays put and does not crease on me. After applying you get a tiny window to blend it out, which it does so seamlessly after which it does not fade. These do really last for hours, easily 8-10 hours. 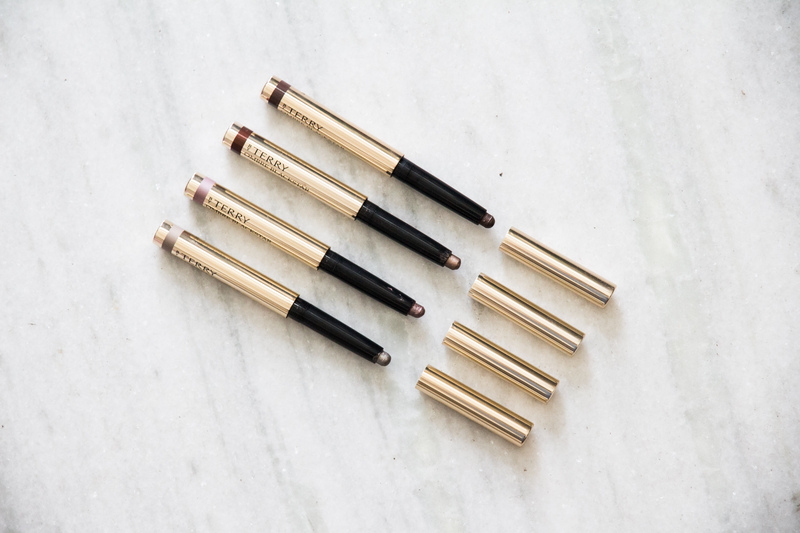 These work well as base and also play nice with other eyeshadows whether they’re matte or a wet creamy eyeshadow. After pouring over every swatch available online, I picked up Bronze Moon and Misty Rock! Bronze Moon is just the perfect medium bronzy neutral. It’s great to just throw on the lid, blend out and not think about anything else. Like all the pearlescent shades, this one has a serious sheen that will last all day. Misty Rock stirred bit of a revolution in my makeup habits. You may have heard murmurs of a pink eyeshadow obsession from me and this is what truly started it. Granted, it’s more of a muted mauve meets pink, but finally finding a wearable pink really made me appreciate the often overlooked pink eyeshadow variety. II prefer using a sheer layer along with a darker brown on the outer corner. Ombre Mercure was picked up on a whim because I realised I didn’t own a silver eyeshadow! You never know when it will come in handy! This one is bit of a shade shifter though, it almost looks like a very very pale gold at times which doesn’t look as stark as a cool toned silver. It’s a very unique shade I felt I needed. Looking back, I guess I really don’t. I’ve worn it few times when I remember to use it as a inner highlight and as you might have guessed, I don’t wear silver eyeshadow very often. Lastly, I picked up Brown Perfection from FeelUnique with a birthday coupon. It’s more of a matte shade and the only one in that finish I own. It’s an espresso dark brown which can be daunting to use as a single eyeshadow but I find that this sheers out to an acceptable tint. It’s also great to pair with any of the other Ombre Blackstars. I use this the most in conjunction with Bronze Moon and Misty Rock. If you haven’t tried any of these before, I’d really recommend Bronze Moon as it would suit anyone. There are some more colourful shades in the range as well but I think I’m done with these for now. Hope you all having a great weekend! I’m travelling for next two weeks so my schedule is out of whack but I will try to post again soon!